I've been wanting to make "everyday" vintage Kuchi pendants for a long long time and here they are! 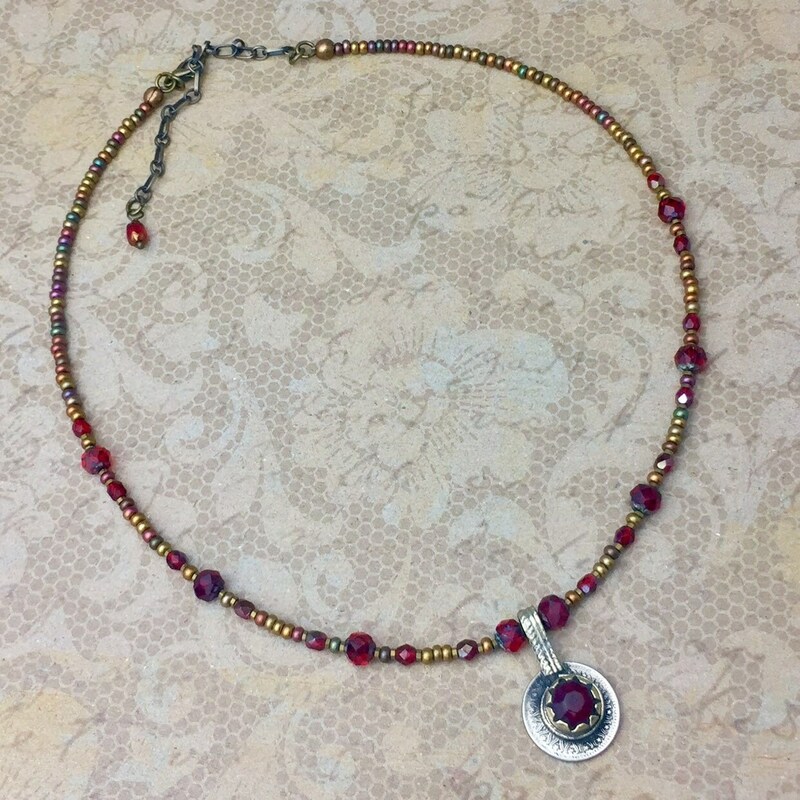 The necklace is made of matte finish glass beads accented with sparkly red glass beads. The original glass centerpiece is distressed and worn and set in a brass bezel on an old silver colored coin - I love the 2-tone metal look! 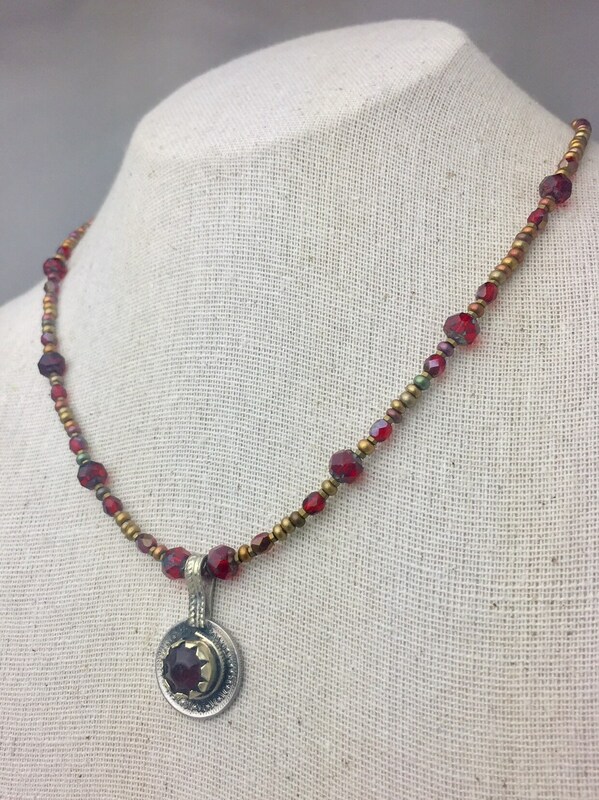 This petite pendant is 1 1/4" long by 3/4" wide and hangs on a 17” beaded necklace with 2” extension. This little bobble is of unknown metal content and is not expected to be hypoallergenic. If you have trouble with metal sensitivities, this bracelet could be lined with fabric or shielded with clear nail polish. Your necklace will be carefully packed for shipment in a sturdy Shiny Sparkly Things gift box. Please report any shipping damage or problems within 7 days of receipt and we'll get you all taken care of. 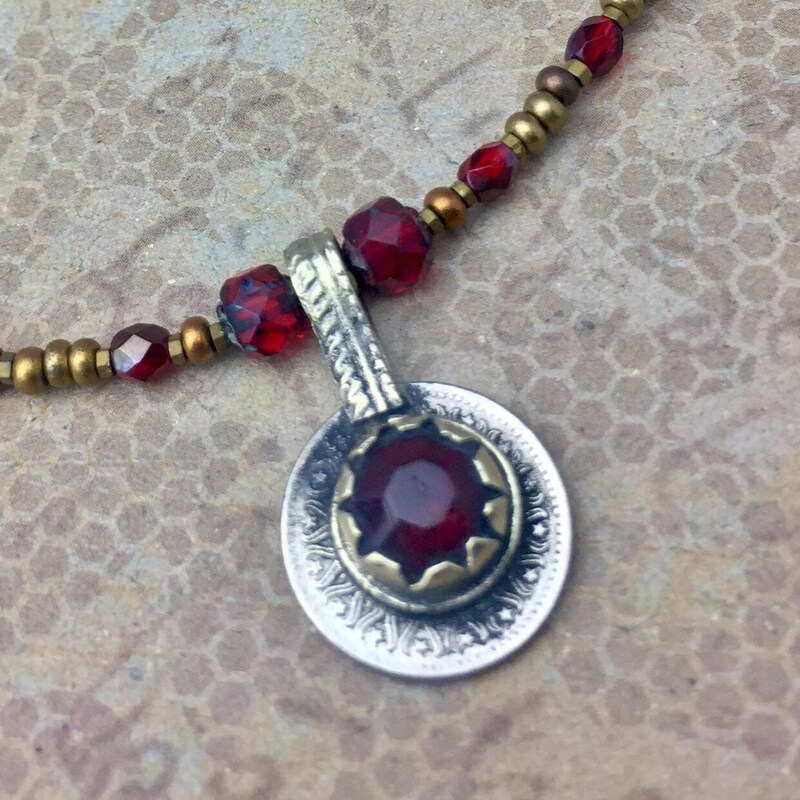 We are deeply committed to providing our customers with the same service we give our family and friends and want you to think of us when you think of great service (and beautiful, unique jewelry, too, of course)! We accept all payment options Etsy offers, including Etsy gift cards. We ship only to the United States and all items are shipped by US Postal Service Priority Mail. We have free shipping on sales over $75; however, the Etsy app isn’t able to discern total sales per order, so I always simply refund any postage collected in error. We gladly refund if you are not 100% thrilled with your purchase. Please convo me within 7 days of receipt to arrange for return. I never share buyer information with anybody else and rarely (if ever) send out newsletters.